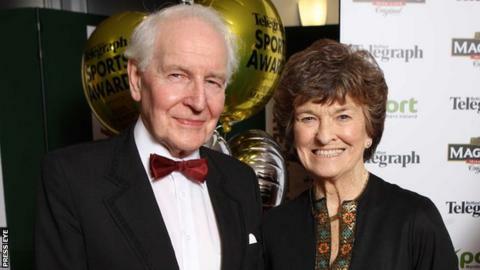 Renowned local athletics coach Sean Kyle has died at the age 88 after a long illness. Sean and his wife, the Olympic athlete Maeve Kyle, set up the Ballymena & Antrim club in 1955 and helped guide a host of top local athletes. Kyle met his wife, Ireland hockey international Maeve Shankey in 1953 and within three years, under his guidance, she had become an Olympic sprinter. Middle distance specialist Kyle coached a host of other international athletes. Those included Mark Kirk, James McIlroy, Sean O'Neill and Eddie King. Dame Mary Peters, who went on to achieve Olympic glory in 1972, had a stint at the Ballymena & Antrim club early in her career while both Kyles continued to coach international athletes well into their seventies with the emergence of the likes of McIlroy, Paul Brizzel, Anna Boyle and John McAdorey. But while they nurtured many stars, their greatest contribution to the sport was the work that they did with the grassroots. During the worst period of the Northern Ireland troubles in the early 1970s, the Kyles were instrumental in setting Top Towns meetings which saw urban centres from Northern Ireland and even a number from the southern border counties compete in team competitions. Kyle was blessed with an enquiring and analytical mind and the duo's combined gifts led talented performers from all over Ireland and sometimes even further afield to glean athletics wisdom from the remarkable husband-and-wife team. Athletics officials from throughout Ireland and further afield have expressed condolences to Maeve Kyle and her family following the news. "Athletics Northern Ireland are very sorry to hear about the death of Sean Kyle, Ballymena & Antrim AC. Thoughts are with the family at this sad time," said the sport's local governing body. A statement from Athletics Ireland said that they had learned of Kyle's death "with great sadness".